I bought an iPod last month. “Did you want an iTunes voucher with that?” chirped the sales girl breezily. “Are you sure? We’ve got 20% off at the moment!” enquired Breezy Sales Girl, with that careful mix of concern and encouragement that conjures up FOMO faster than logging out of Facebook. It was at this point that I decided to gesture awkwardly to the pile of CDs I was holding – and fully intending to purchase – in their tangible, plastic-cased, liner-notes-filled glory. For a second there, my helpful neighbourhood shop assistant failed to comprehend my motives. For a second there, I have to admit, so did I. After all, she had just helped me select a digital music device; and now, with an opportunity to buy 20% more music, spend 20% less money…I was still firmly clutching my environmentally-unfriendly, bookshelf-filling, dust-collecting, old-fashioned stack of compact discs. Ex-Breezy Sales Girl recovered herself admirably, though the concern thing she’d had going suddenly became a little more genuine. “Oh! Oh…yep…you’re right…sure!” Leaving my perplexed companion, I made my way to the sales desk, quietly pondering my progressive/stick-in-the-mud music consumption habits. I fell in love with MP3 players at an early age. At an engagement party for a school friend of my mother’s, I met no less than 5 fellow thirteen-year-olds in possession of these magical pocket-sized jukeboxes. When I eventually obtained my very own predecessor of the iPod, I couldn’t have been prouder. With its impressive capacity of 128MB, I could finally take the entirety of the ABBA GOLD collection everywhere I went. Occasionally, I swapped it for my 1980’s compilation of U2 hits. This, I thought, was technology at its finest. The good old days. 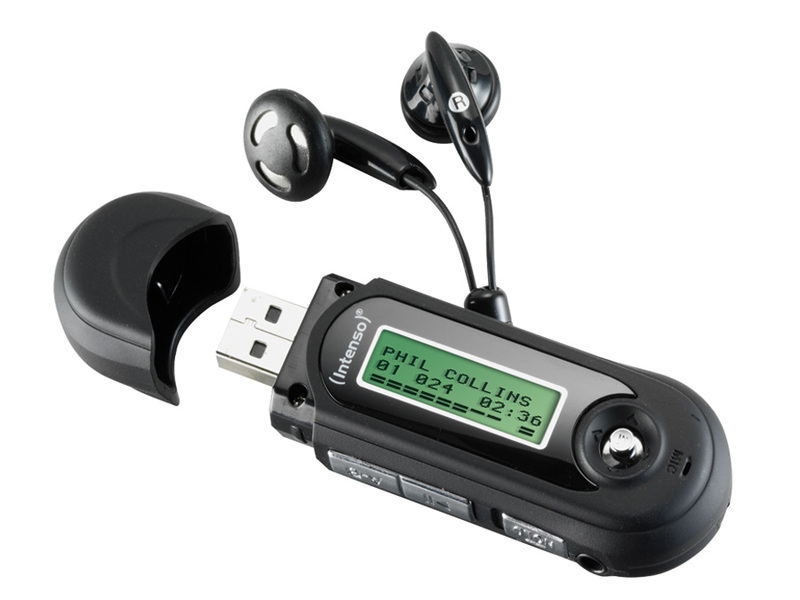 This is almost exactly what my first MP3 player looked like. Gotta love that sneaky USB connection! By the time my musical taste required me to have the entire Beatles catalogue close by at all times, I had upgraded to a snazzy little 512MB number, which was followed in later years by my becoming a patron of the omnipresent iPod. See? I can move with the times! With each increase in storage capacity and sound quality, my excitement bubbled over – today, holding the latest generation of iPod nano in my hand, I feel that same thrill of having all my music on tap, in such a marvellous little device. But quite paradoxically, if the albums in my iTunes library aren’t also on my bookshelf, I feel strangely deflated. In a day and age when a music nerd such as myself should be jumping up and down praising the availability of my favourite art form, I find myself disappointed with every digital purchase or streaming opportunity. Perhaps it’s because as a working musician, I have always felt music to be an experience, rather than a commodity. Attending live music is much more than the notes that reach our ears, playing music is much more than reading those notes off a sheet; owning music is not just the songs, it’s the feel of the packaging, the look of the artwork, displaying it in alphabetical order alongside the rest of an ever-growing collection (is that just me? It’s not just me). Perhaps it’s because I associate the purchase of CDs with my tender university years, lingering in music shops and making the delicious choice of which album I’d bring home with me that week. Either way, my primary source of music has always been real, actual, CDs…that I then rip to my iTunes library. I’m a musician, not a logician, okay?! 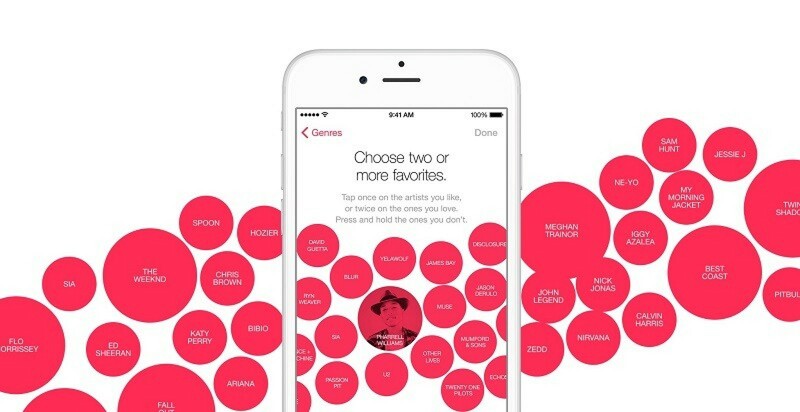 But despite this love of album-collecting, I have signed up for an Apple Music trial. I’ll admit: I was slightly terrified. SO MUCH CHOICE. HELP ME. Digital music offers such a gratuitous overload of choice, it feels much like going into a bookstore and being told I don’t have to buy whole books anymore, I can just buy my favourite pages. WHICH PAGE, WHERE DO I START. And do they even mean anything when ripped from their original context, shuffled into a ‘genius’ order and spat out again? Well, I’m not gonna lie: I feel like a kid in a candy store. For the first time in my life, I don’t have to consult my budget before deciding to listen to all the latest albums in full. I can explore the unchartered waters of bands I’m curious about, but not convinced enough to buy into. 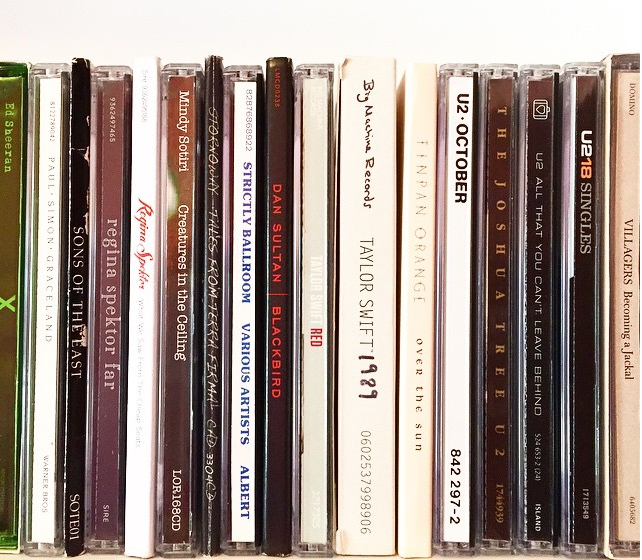 I don’t have to actually own any of the music that I reluctantly admit to enjoying *coughsTaylorSwiftcoughs*. So now I’m faced with the startling question: could this be my music consumption future? Even with my starry-eyed love affair with pretty packaging and outdated technology? I think it could. Maybe. As I seriously consider allowing Apple to take my money every month in return for this glut of music, I realise that if I choose the digital path, that means ceasing to buy albums in their hard copy form. Which means dealing with a distinct sense of loss. Not just of lingering in the aisles and revelling in liner notes, but also of the delayed gratification involved in deciding which album to commit to. But given my insatiable appetite for new sounds, perhaps moving with the times won’t hurt quite so much.